Most businesses upgrade office phone systems every 7-10 years. Selecting an office phone system and features is a big decision and one you'll most likely have to live with for the next decade. You don't want to settle for "good enough" now because upgrading in a few years may not be an option after all. It's best to anticipate what your users want and need over the next decade. Nobody has a crystal ball, but you can future-proof yourself. Phone system hardware, features, and the type of service you select can all have an impact on the implementation and maintenance costs of a voice-over-IP (VoIP) office phone system. Name brand phone systems with extensive features are costlier than low-end, generic phone handsets, but you ultimately need an office phone system which will meet the requirements of your workforce for several years to come. An office phone system is an expense, but you need a phone system that your employees will be happy with which will give you a communications advantage in the market. Atlantech Online serves business and government only. Every day we hear about their wants and needs, so we can show you which office phone system features will make the difference between “good enough” and “best-in-class,” so you can keep realizing value from your phone system over a 7-to-10 year timespan. Learn more in What is the Best Small Business Phone System? The best way to select features is by understanding the types of phones your business requires, which can vary by line and user type. Some or all of your business users may require advanced features to support conference calling, while some users’ needs may be sufficiently met by standard desktop handsets which offer basic features such as call waiting, holding, transferring, and speed dial. Some of the more popular small business phone models are the Polycom VVX series, Cisco 68xx, 78xx and 88xx series phones, and Yealink phones. The following eight features are based on the Polycom VVX 501, which I use as my work phone. VoIP phone systems are increasingly mobile-first, which means they offer mobile applications that seamlessly extend the capabilities of business communications to smartphones and other mobile devices. Wireless IP phones, such as leading models from Polycom, now offer cordless phone systems with desk phone capabilities so that you can carry your phone calls throughout the office during busy work days. Not every user in your office needs a wireless option. For some users, such as someone in a call center, the wireless capability may be unnecessary. However, for other power users and managers who frequently attend meetings and work in the office away from their desk, a mobile or wireless option can extend communications wherever they are in or out of the office. Your team can't work effectively with colleagues or clients if they can't hear each other speak clearly. High-quality sound is a critical component of any effective office phone system. HD audio solutions are available for a variety of handsets and phones for many settings in the workspace. Enterprise-grade phone systems for businesses of all sizes reduce the interference from background noise in the busiest office settings so employees can communicate more effectively. HD audio solutions can improve productivity for desktop phones, conference communications, and contact center employees. If your business is deploying VoIP as a component of Unified Communications as a Service (UCaaS) or considering Unified Cloud Communications, it may be essential to consider whether your phone system can support multimedia cloud connectivity. Leading phone systems, such as the Polycom 500 and 600 series, offer support for video conferencing via external USB connectivity with an HD video camera and a large touchscreen to support the communications needs of managers and knowledge workers. While your business may be planning to scale your communications into the cloud shortly, remember the 7-10 year lifespan of the typical business phone system and opt for extensible systems. Power management is an essential component of phone system management. If a phone draws more power than an adapter or switch can provide, it can result in a power "brownout," or the accidental drop in the power supply within the office. Brownouts can result in power loss in the business network, a peripheral malfunction in the communications system or phone system reboots. If the phone is not in active use, it doesn’t need to be drawing power actively. Leading phone systems, such as Polycom, are intelligently engineered to switch to low power settings during periods of inactivity to protect network health and business continuity. Video is the preferred form of content among consumers in 2019. Almost 5 billion YouTube videos are watched online every day, and 6 out of 10 people prefer digital videos to traditional television. In the workplace, communications delivered via training may have a more significant impact than similar messages conveyed via text or audio message. Some phones with HD, large-size screens offer streaming video playback directly on the phone screen. Polycom®RealPresence® Video Content Management solutions support the convenient access of view video content, including live-streaming webcasts and video recordings from a web portal directly from the business phone system, a desktop computer, tablet, or smartphone. You probably lose hours each day of potential productivity due to incompatible business communications technologies. Every time you tab between windows and switch between devices or stop a task mid-stream to respond to an email you can get distracted. The Polycom phones and other leading models offer direct Desktop connectivity, which enables you to use your mouse and keyboard to enter information directly into your business phone. Desktop connectivity saves time over having to manually look up information on your computer and then type in a name or phone number into the phone. You can simply click-to-call directly from your computer screen. 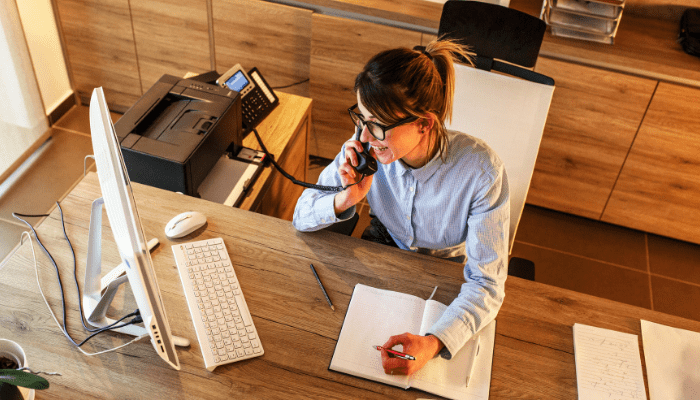 When a Desktop-connected telephone is used in conjunction with a UCaaS suite such as Cisco/Broadsoft, it can act as an extension of your unified inbox. Voice clarity should be an expectation for any of the best office phone systems, whether you're working in a small team setting or a full contact center. If your employees are communicating in environments with a moderate or high amount of background noise, you may be significantly benefited by phones which offer technology to protect communications clarity, such as Polycom's proprietary "Acoustic Fence” which can block out common sound distractions such as coworkers voices, loud machinery, or other background noises. Polycom phones create an acoustic fence with the use of multiple microphones to filter remote noises from being relayed to other parties on the phone call. How much can you expect to pay for the best office phone systems? The cost per handset depends on the brand you select and the number of features needed. However, an approximate cost range for most VoIP-compatible phone systems is approximately $200-$1,000 per handset. If you choose low-end, generic hardware with minimal features, you can expect to pay $200 per handset. A name-brand system with extensive features is likely to cost closer to $1,000, especially if you are selecting phone systems which can accommodate conference calling and HD video conferencing. Other factors which can impact the total costs of your phone system include implementation, training, and phone system maintenance, as well as the optional addition of UCaaS features. 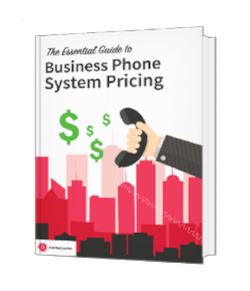 To learn more about how to manage the costs of your new business communications system, we recommend the free eBook: The Essential Guide to Phone System Pricing.